When reading the ancient stories in God’s Message, I’ve learned that a big part of the story is often not what is said in the text, but what is left unsaid. I found it interesting last week when we read 1 Chronicles 20 that the scribe left out the naughty bits about David’s sin with Bathsheba and his conspiracy to murder Uriah, her husband. Today, the scribe moves right into the story of David commissioning his son Solomon to build the temple, but why Solomon was chosen as the one to ascend to the throne is never addressed. Through the millennia, it has been a common practice in monarchies around the world for the throne to be passed to the eldest living son. In the case of King David, there were many children born to him from a handful of wives and several concubines. David’s scandalous dalliance and subsequent marriage to Bathsheba happened relatively late in his life. There were several sons born to David prior to Solomon, but David chooses his young son Solomon, born to him through Bathsheba rather than any of his other children. Very few families escape the conflicts, machinations, and hard feelings that arise from parental favor and estate. This is true even of simple nuclear families trying to settle issues of a parent’s last will and testament. Imagine the chaos that ensues when polygamy, the throne, political power, and vast riches are at stake. David’s choice of the young Solomon could not have gone over well with his half-siblings who had been waiting in line for the throne for many years. We don’t know why David chose young Solomon over his siblings, but David had a long track record of seeking to do the right thing in God’s eyes. I must wonder if David’s choice was based on what he saw in the hearts of his children rather than sticking with human protocol of simply handing the crown to his eldest. Life is full of choices and decisions. Handling family dynamics with children of diverse personalities, gifts, and capabilities can be difficult for the even the most dutiful parent. 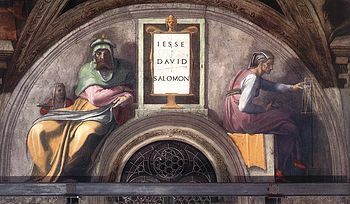 It requires, if you’ll forgive the blatant connection, “the wisdom of Solomon.” And, perhaps, that is what David perceived in making his unorthodox choice of successor. Building a deck is a test of patience, similar to what I imagine the temple must have been. It takes people with different skills than I and that requires their availability. Between the weather and dealing with other people and their busy schedules, this will indeed be the project of 2014. Now begin the work, and the Lord be with you. Amen.